Beautiful fashion model Sylvia Morel (Anita Ekberg) receives news that she has inherited a castle from her uncle. Her curiosity leads her to journey to a remote village to see her new house. Once there, she learns of her family's history and soon falls under the spell of her uncle. He wants her to become the new matriarch of the family … a clan of vampires! 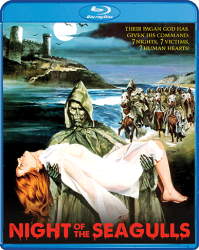 This chilling tale of bloodsuckers was directed by Spanish horror director Amando de Ossorio (The Lorely's Grasp, Night of the Sorcerers, the Blind Dead series).